Many of you already know the admiration with which I hold Swiss perfumer Vero Kern. Her three extraits de parfums (Onda, Kiki and Rubj) provide for endless olfactory fascination. But unlike many niche perfumes, Kern’s actually work as “statement scents” not mere curiosities for me and my wrist. Having lived in that country of milk and mountains, I can say that her creations are most definitely not Swiss in conception or execution. They are very French but without the million-dollar advertising hype we associate with the great maisons de parfums. Strangely enough, Rubj has been the hardest nut of the three for me to crack. Perhaps because it makes me feel so good when I wear it. No wonder, then, that Kern is an aromatherapist by trade. 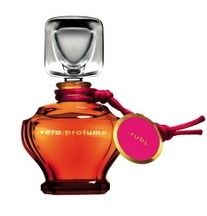 With Rubj she manages to attune the innocuous white floral with a deep, musk- and jasmine-laden heart. Orange blossom absolute from Morocco (nectar bursting into sunlight) coats the outside of this olfactory objet, and then layered behind it are Egyptian jasmine and tuberose (indolic and sweaty-sweet) and very fine (read: not dirty) musk notes. At first approach, one’s nose might characterize this as borderline fruity, but there’s enough complexity lurking underneath to turn your eyes off the dessert platter and into the candlelit bedroom. If you own and love Fleurissimo, this is the next step. Kern’s extraits come in gorgeous, vintage-inspired crystal flacons with ground glass stoppers, but there’s nothing old-fashioned about them. 7.5 ml will run you around $165, 15ml around $260. They are available online at veroprofumo.com, and will soon have limited distribution in the United States. I find Rubj to be an exquisite, exuberantly joyful scent. I admire it, but it doesn't love me, alas. So, I merely smell it often, and wear the other two. Even in darkest, strangest ONDA there's a sense of something beyond, the cerulean sky that peeks in at the cave's mouth. We can only pray that her future scents will be as good as the first three. I'm not certain there will be more scents from Vero - she spent so much time perfecting these, they might well be her "grand oeuvre", the essence of her art and person, the one perfect (triple) peak. But we can always hope! I don't quite agree with Dinazad, having spoken with Vero... More scents are in the works, though they might take some time to be perfected to her exacting standards. I think what best defines all three compositions is that they have a soul. At least they truly speak to mine. Like Helg, I would say that Rubj is the one that comes in third in my heart, but it has surprising complexity once you dig into it. Denyse, Thank you for enlightening us all. I, too, have it from the perfumer's mouth that we haven't heard--or, in this case, smelled--the last of VK. Rubj has complexity and is very wearable. I gave a sample to extremely discerning female colleague, and it has become her "date" scent. Brava!